Handmade necklaces, chokers, hasli, Pendants and chains - Ahilya has a wide range of necklaces that vary in size, aesthetic and finish. 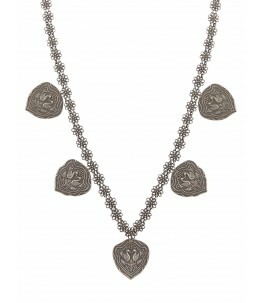 A beautiful tribal sterling silver necklace is all you need to dress up an outfit and look your absolute best. Ahilya necklaces are made with pure metal, so they remain as beautiful pieces of jewellery that you can pass down generations with their antique vintage look. Whether you love silver or gold, there are hundreds of fabulous ethnic necklaces in oxidised silver, gold plated and even dual plated styles. Try layering a couple of necklaces together if you prefer minimal styles, pair a silver choker with a silver beaded necklace to give some balance or even layer silver chains together to complete that look. Statement Silver Necklaces – Wearing one beautiful, eye-catching designer necklace, can really complete an outfit. Fashionable statement necklaces can be worn with ease and are easily the go-to piece of jewellery. Our hand painted statement silver necklaces with miniature deity paintings are truly unique and different. With detailed animal and bird motif engraving, like peacock motif or parrot motif, these pieces are a great mix of traditional designs in newer avatars. 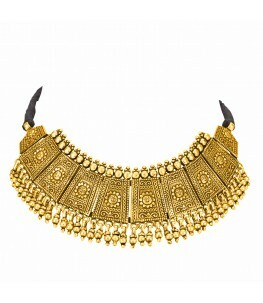 These owe inspiration from South Indian temple jewellery. Silver Cord necklaces – Cord necklaces with silver pendants, or thick silver cord necklaces are the newest bohemian trend. Silver looks great when strung in colourful cord, and can be worn to either dress up or dress down an outfit. Silver chokers – Chokers are the hottest trend right now! Whether they are beautiful statement silver chokers or minimal silver chokers, this style is definitely one of the most versatile. Whether you decide to mix it up and wear ethnic chokers with a western outfit, or layer a lovely silver choker with a statement necklace, silver chokers are no-fuss and easy to wear! Silver chains – Silver chains, although the most basic come in various designs and patterns. Whether you use them to string silver pendants in or wear these dainty silver chain necklaces as is, these are lovely to wear every day. If you want to make this a statement look, just layer a long silver chain with a dainty silver necklace. Dual toned Necklaces – With the advent of rose gold jewellery, the options are now enormous. Dual toned necklaces look elegant and you never have to choose between two metallic hues! Look at our unusual Tarakasi or Taarkashi piece that comes from Orissa !!! Contemporary silver necklaces – Whether you like dainty silver necklaces or more minimal styles like the silver bar necklace, we have a huge collection of contemporary silver necklaces with ethnic styles in more contemporary design, or cleaner, more minimal finishing. Silver bead necklaces – With a variety of different kinds of beads – engraved, etched and beautifully handcrafted, silver beaded necklaces are almost a necessity. Antique Silver necklaces – We love vintage, oxidized silver necklaces with antique finishing. Heavy, silver antique jewellery is highly coveted worldwide and we offer a range of unique, unusual, and decadent antique silver necklaces. Antique silver coin necklaces made from old guinea coins are a favourite and look absolutely exquisite, especially when paired with antique silver coin rings or antique silver coin earrings. These come from Jaipur, Rajasthan.